2017 is the 25th consecutive year Master Gardener Volunteers have offered a summer gardening program for children through Cornell Cooperative Extension of Suffolk County. Growing interest in this program has led to a renovation of the garden, including a new pergola and paved walkway, hoop houses for growing early and late season vegetables, as well as identification and special care of many pollinator-friendly plants in the garden. Favorite activities from previous years include a visit from the Worm Lady, a tour of the Butterfly House at the Farm, a wagon ride tour of the Farm, and much more. On the last day of the program, we’ll enjoy a celebratory feast, prepared from bounty we harvest from the garden. The 2017 program provides a hands-on gardening experience for children. Children ages 5 and up are best suited for the program, which is not parent participatory. They will be divided into two groups – ages 5 to 8 years and 9 to 12 years – with age appropriate activities for each group. All children will keep nature journals to record their time/experiences in the summer program at the Children’s Garden. The eight-week gardening session will meet on Wednesday mornings July 5 through August 23 from 10:00 to 11:30 a.m. The Children’s Garden is located at the Suffolk County Farm in Yaphank. Interested? Click here for a registration form. This entry was posted in Uncategorized and tagged Children's Garden at Suffolk County Farm, Master Gardener Volunteers on May 10, 2017 by njc23@cornell.edu. CCE Suffolk trains Master Gardener Volunteers to provide the public with gardening programs and activities that draw on the horticultural research and experience of Cornell University. MG Volunteers receive research-based instruction and are kept up-to-date through continual exposure to the latest developments in environmental horticulture. In return, they agree to share their knowledge with neighbors by volunteering to do community service. After completing the training course and volunteering for 125 hours, they become certified as CCE Suffolk MG Volunteers. Suffolk County’s MG Volunteer Program, along with similar programs in other counties in New York State, is directly linked to Cornell University as part of its National Land-Grant College charter. 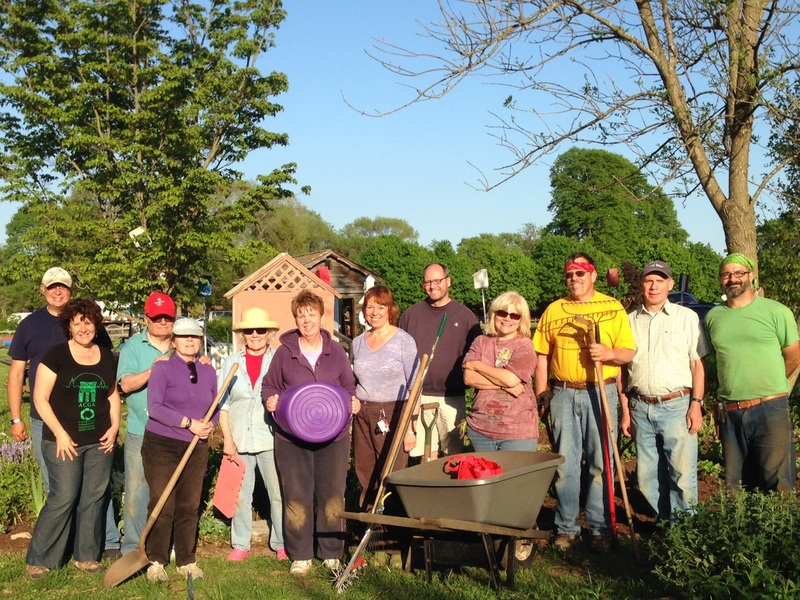 This tie to Cornell provides MG Volunteers with state-of-the-art gardening knowledge. 2016 MG Volunteer trainees learned how to create healthy soil by sheet mulching compost materials into raised beds. Photo © Robin Simmen. The next training course for new MG Volunteers is planned for 2017, beginning February 1 and ending June 28. We have revised the curriculum and weekly schedule to provide more hands-on training and make it accessible to people who work Monday through Friday. Starting February 1, weekly Wednesday evening lectures will be held 5:30-8:30 p.m. at CCE Suffolk, 423 Griffing Avenue in Riverhead. Starting April 1, Saturday morning classes will also be held 9:00 a.m.-noon in the field (weather permitting) every other week at various locations from Amityville to Riverhead until the course ends June 28. The cost of this comprehensive gardening course for community volunteers remains $375 with an additional $125 deposit, refunded upon completion of 125 hours of volunteer service. Download the application here. For more information, please call or email me soon; the deadline to apply is October 31. This entry was posted in Long Island gardening, Master Gardener Volunteers and tagged Bayard Cutting Arboretum, Children's Garden at Suffolk County Farm, community beautification, community volunteers, Cornell Univerisity, gardening course, Long Island gardening, Master Gardener Volunteers, National Land Grant College Charter, Spring Gardening School, Suffolk County Farm on October 20, 2016 by Robin Simmen. Ever wonder whether it really makes a difference whether or not you plant native species? Do native plants do a better job of hosting local insect communities than their non-native counterparts? Now a University of Delaware study shows that not only are natives much better at sustaining local insects, planting non-natives actually compounds the problem of declining species diversity because non-natives support fewer herbivore species across our landscapes. 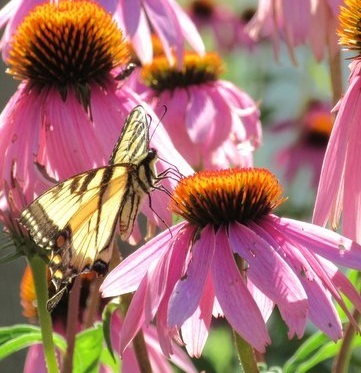 A yellow swallowtail enjoying a purple coneflower at the Children’s Garden at Suffolk County Farm, part of the National Pollinator Garden Network’s Million Pollinator Garden Challenge. Photo by Mary Howe. The research was conducted by Karin Burghardt and Doug Tallamy, who is professor of entomology at University of Delaware and author of the bestselling book, Bringing Nature Home. Together they published their findings in a recent issue of Ecology Letters: http://onlinelibrary.wiley.com/doi/10.1111/ele.12492/abstract To conduct their study, they planted imitation yards with different common garden selections of both native and non-native tree species, and then collected data over a three-year period, measuring the herbivore communities and species found on those plants. He also stressed that that native plants always do the best job per tree of supporting herbivore communities when compared to their non-native counterparts. This study expands the understanding of that fact by looking at whether that lower per tree diversity is magnified further by non-natives hosting more similar communities across trees species and locations. Learn more about how what you plant affects biodiversity at the Long Island Native Plant Initiative’s biennial Native Plant Conference on Saturday, October 24, at Farmingdale State College. LINPI’s Registration Flyer includes a symposium agenda and list of speakers. Robin Simmen is Community Horticulture Specialist for CCE Suffolk. She can be reached at rls63@cornell.edu or at 631-727-7850 x215. This entry was posted in Long Island gardening, Native plants, Wildlife habitat and tagged 2015 Long Island Plant Native Plant Symposium, biodiversity, Bringing Nature Home, Children's Garden at Suffolk County Farm, Doug Tallamy, insect hosts, Karin Burghardt, LINPI, Long Island Native Plant Initiative, National Pollinator Garden Network, Native plants, non-native plants, pollinator gardens, University of Delaware on October 16, 2015 by Robin Simmen. 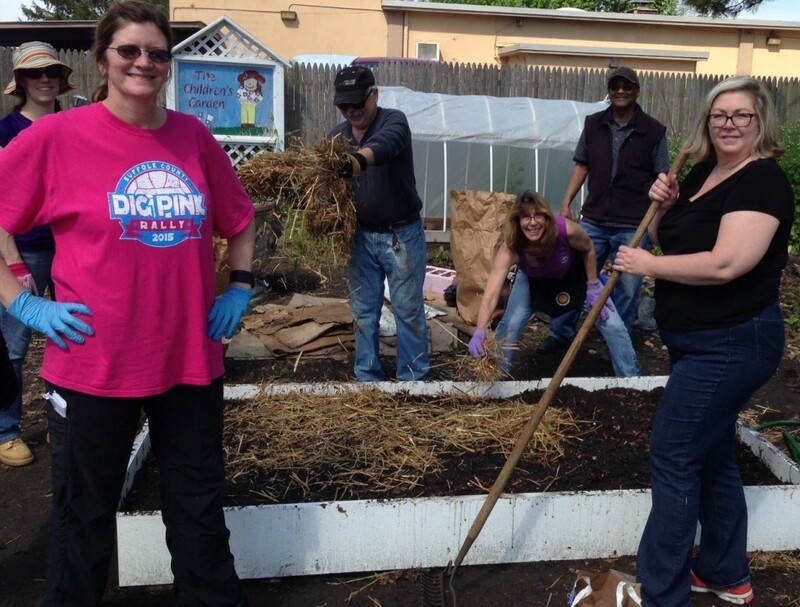 A happy tribe of Master Gardener Volunteers keeps the Children’s Garden growing at Suffolk County Farm. The next training course for new MG Volunteers will be held in 2016, beginning February 3 and ending June 29. We are revising the curriculum and weekly schedule to provide more hands-on training and make it accessible to people who work Monday through Friday. Starting February 3, weekly Wednesday evening lectures will be held 5:30-8:30 p.m. at CCE Suffolk, 423 Griffing Avenue in Riverhead. Starting April 2, Saturday morning classes will also be held 9:00 a.m.-noon in the field (weather permitting) every other week at various locations from Amityville to Riverhead until the course ends June 29. The cost of this comprehensive gardening course remains $375 with an additional $125 deposit, refunded upon completion of 125 hours of volunteer service. Download an application here. For more information, please call or email me soon; the deadline is October 31. This entry was posted in Long Island gardening, Master Gardener Volunteers and tagged Bayard Cutting Arboretum, Children's Garden at Suffolk County Farm, community beautification, community volunteers, Cornell Univerisity, gardening course, Long Island gardening, Master Gardener Volunteers, National Land Grant College Charter, Spring Gardening School, Suffolk County Farm on October 9, 2015 by Robin Simmen. The Million Pollinator Garden Challenge (MPGC) has been launched by the National Pollinator Garden Network, an unprecedented collaboration of national, regional, conservation and gardening groups to support the President’s Executive Strategy to “Promote the Health of Honey Bees and Other Pollinators.” MPGC is a nationwide call to action to preserve and create gardens and landscapes that help revive the health of bees, butterflies, birds, bats, and other pollinators across America. The goal is to move millions of individuals, kids, and families outdoors and help them make a connection between pollinators and the healthy food people eat. MPGC wants people like you to register your gardens through their Pollinator Partnership and thus be added to the map they’ve created in support of this campaign. Along with a handful of other gardens on Long Island, the Children’s Garden, which is maintained by Master Gardener Volunteers at Suffolk County Farm, has been registered and is on the map, which appears in the link below. This entry was posted in Wildlife habitat and tagged bees, Children's Garden at Suffolk County Farm, honey bees, Master Gardener Volunteers, Million Pollinator Garden Challenge, National Pollinator Garden Network, pesticides, pollinator gardens on August 12, 2015 by Robin Simmen.